Ok this is a post for the parents of young kids out there... I guess mostly girls. Dora the Explorer, along with some of the pups from Paw Patrol (for the boys, apparently - my eldest girl enjoys Paw Patrol more than Dora these days) is coming to town and will be running live shows and meet & greet's every day from tomorrow until the 12th of September (but there won't be any shows on the 11th of September). The show will be taking place at the Qurum City Centre mall and each show is 30 minutes long. UPDATE: It's also happening at Muscat City Centre, after QCC - so same timings, but between the 14th and the 17th of September. 5:00pm, 7:00pm and 9:00pm, with meet and greet for the kids running from 4:00pm - 10:00pm (stopping for the shows of course). 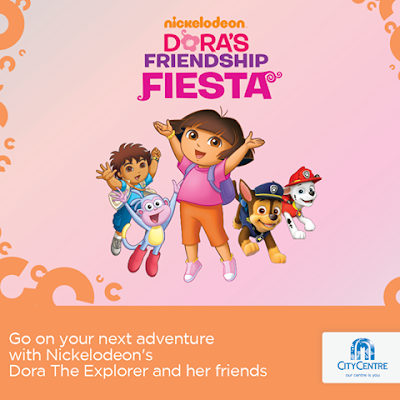 Now, given that Dora's target audience is 2-5 year olds, who's kids are going to be up at 10pm for a meet and greet with Dora? The answer is probably loads! But definitely not mine, I'll try my luck for a 5pm show! Get there early... Shaun the Sheep was hell for us parents last Eid;).